There are a variety of ways to create stereographic effects. Click Cameras. In the same way music is stored on records, tapes, CDs, or MP3 files, stereographs are displayed on a variety of media. Although most of the images on this site are best viewed as prints in stereo viewers, they can be appreciated on the computer monitor. You can see the stereo effects if you can freeview. If not, Berezin Stereo Photography Products sells the best viewers for stereo pairs on the net and for most books for only $3. For tips, click Viewing. Stereographs have been made since the 1840s, and there is a handful of artists doing superb work in the medium. Click Gallery. Naturally stereography has its own jargon. Click Glossary. There are hundreds of websites with info for the stereo enthusiast. Here are some of the best. Click Links. Click here to read an interview with me at ephemera.com. Movies are changing right before our eyes. Before too long, most of them will be "3D". 3D television is now here too. And digital cameras are changing. In summer 2009, Fujifilm introduced the first compact 3D digital camera for consumers. The new 3D movies are made with a very cool whiz-bang technology that has been around for more than 150 years. That's right. This is not new stuff. The technology is called stereography and it is pretty simple. It is stereo for the eyes. Everyone is familiar with stereo sound. You have two ears about eight inches apart, and so stereo music has a left and right channel. Well you also have two eyes about two inches apart, and they allow you to see depth. We see and hear the world from two different angles, and our brains process the information into a single picture or sound that has depth and dimension. Stereo recordings use two microphones, and stereo photos use two lenses. Just hold up a finger at arm's length. Look at it with both eyes. Then look at it with one eye. Then the other. Notice how the backgound shifts? The distance between our eyes causes this, and it enables us to see depth in the world around us. As a predatory animal the ability to gauge depth enabled us to throw rocks and spears with accuracy and move to the top of the food chain. Cover one eye and try hitting a baseball. Not very easy. The English physicist Sir Charles Wheatstone was the first to demonstrate this phenomenon by making drawings from the viewpoints of each eye. He made a device with mirrors to demonstate the phenomenon, and gave it a name of Greek derivation, "stereoscope." Stereographs are remarkable, often breathtaking, slices of reality that can transport the viewer out of body. When people first see a good stereograph the response is almost always "WOW!" The first 2D photographs were made in the 1830s and the first 3D stereographs were made about a decade later, in the 1840s. 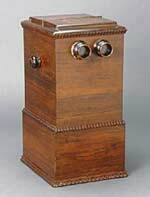 From 1860 to 1920 practically every middle-class and upper class home had a stereoviewer and a drawer full of stereocards. In its heyday it was the way we saw the pyramids, the Taj Mahal, Big Ben, and the Great War. It was the television of its day. With the popularization of movies, then newsreels, and finally television, interest in stereography waned. It enjoyed a niche revival in the 1950s with the popularity of View-Master. Since View-Master was introduced in 1939, one billion reels and 100 million viewers have been sold, mostly in the 1950s. Then in the late 1990s, IMAX introduced a new stereo movie projection system that, along with computer graphics and virtual reality machines, promises to increase the number of devotees, collectors, and creators. In 2009 more than a dozen major motion pictures were released in 3D and in 2010 dozens of films will be in 3D. Several television manufacturers are working on 3D monitors for computers and the living room, and the new Fujifilm FinePix REAL 3D W1, introduced in 2009 likely is the leading edge of the next digital camera revolution (to read more about it, click here). At the dawn of the new millennium, the craft of stereography is evolving into an artform. This site tracks that evolution.